Announcement Welcome to the world of LILROO, where you will find an assortment of children's printable art in a bold assortment of bright and vibrant colors! Easily download and print your own art to decorate your baby's nursery, kid's room, playroom, preschool and more! LILROO is inspired by my two little ones, Lily and Andrew (Roo)! When I was pregnant with Lily, my world as a mom started taking shape as I sought to create a colorful, cheerful nursery for my baby girl. We love rainbows, bold pops of color, and the ease of printing exactly the size you need to decorate your children's special spaces. I am excited to introduce the Rainbow Print Bundle, coming April 2019, as a one-stop design solution for your decorating needs! Welcome to the world of LILROO, where you will find an assortment of children's printable art in a bold assortment of bright and vibrant colors! 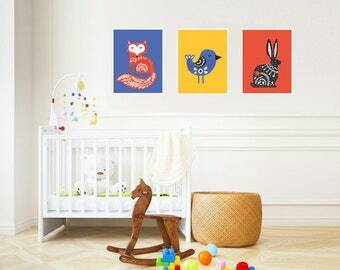 Easily download and print your own art to decorate your baby's nursery, kid's room, playroom, preschool and more! The quality of paper is excellent. Package arrived undamaged and the poster is super cute. Shipped new and nicely in a timely manner. New to the shop, the "Lily" hat, inspired by my imaginative, carefree girl. 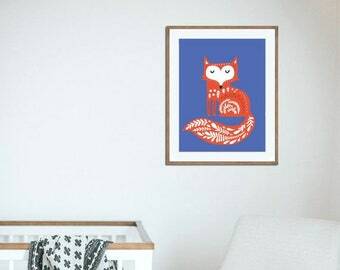 For the minimalist nursery, the ScandiBoho fox on blue will add the perfect pop of bold color. Bloom & Grow with bold florals, a beautiful art print for a nursery, office, big kid or dorm room! 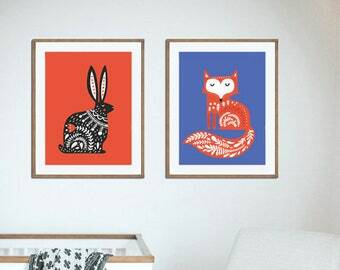 For the minimalist nursery, the ScandiBoho bunny on muted red will add the perfect pop of bold color. Wild Thing - you make my heart sing! Adding new colorful and cheerful baby and kid tees every week! LILROO celebrates the building blocks of childhood, imagination, creativity, exploration and discovery! Hi! I'm Shannon, the designer and maker behind LILROO! I started designing art prints when I was pregnant with my daughter, Lily, dreaming up a colorful nursery for her to be inspired, think creatively, imagine worlds of wonder, and encourage her to explore, be brave, be kind, and be herself. I am all about positivity, encouragement, and giving our kiddos the tools and encouragement to grow into remarkable humans, while enjoying the very best things about being a kid. It goes so fast, so we'll enjoy it as best we can! Shannon is the graphic artist, photographer, and creator of LILROO. She loves anything that inspires creativity, and is a lover of musicals, living in New England, and all things nautical, whimsical and geeky.